I found an interesting Kimono Atelier in Kyoto. 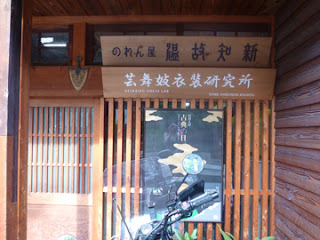 "Shi-kunshi Koubou"（四君子　工房） is the name of this Atelier. It means "Four wise man's atelier". There are 4 artisans here. In this Atelier,people are creating Maiko kimono and private customer's kimono. The inside of the Atelier. and there were many kimono exhibits. I found an kimono artisan working. His name is Tsuge Ittou. His art works have won so many prize! He has been working as kimono artisan since 1974! He is a skillful,experienced kimono artisan. It describes the scenery along the river. He is going to dye this white cloth from now. He uses so many painting tools! As you see,there were so many beautiful clothes exbits here. According to him,they are samples of Maiko's kimono. Because there are many other interesting arts here! Thank you for always visiting my blog.